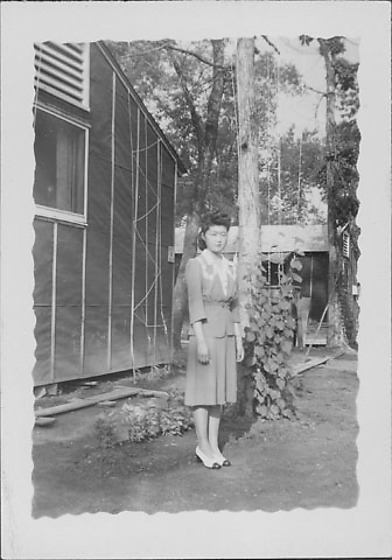 Full-length portrait of a young woman in eyeglasses and suit standing near barracks and string trellises at Rohwer concentraiton camp, Rohwer, Arkansas, 1942-1945. Dressed in suit with 3/4 length sleeves and white embroidery on shoulders, and two-tone shoes, woman stands her arms at her sides, turning slightly to the R. Bare string trellis in front of barracks in background L; string trellis with vines in front of tree in background R; roof of another barracks visible, TR. Cropped image of 97.292.7V.